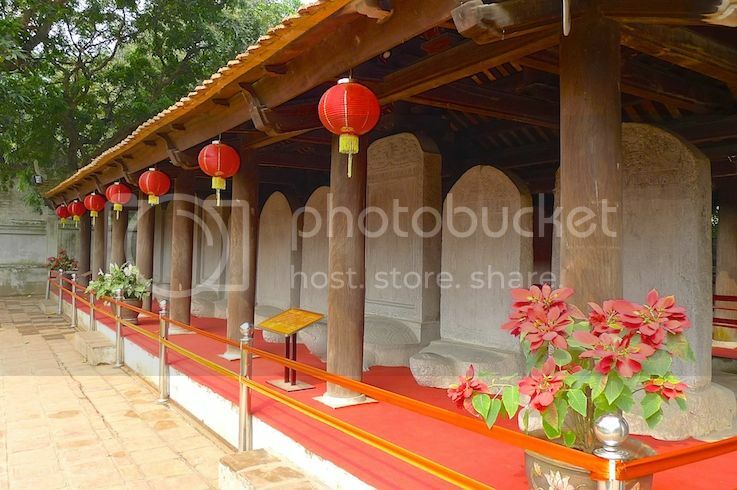 After our delicious lunch at Koto Restaurant, my friend and I went over to the Temple Of Literature which is located just opposite the restaurant. 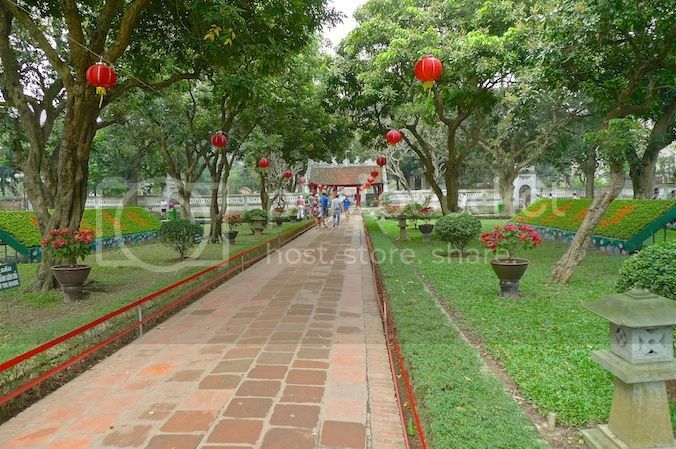 However, the entrance was at Quoc Tu Giang Street, so we walked a little further to reach it. 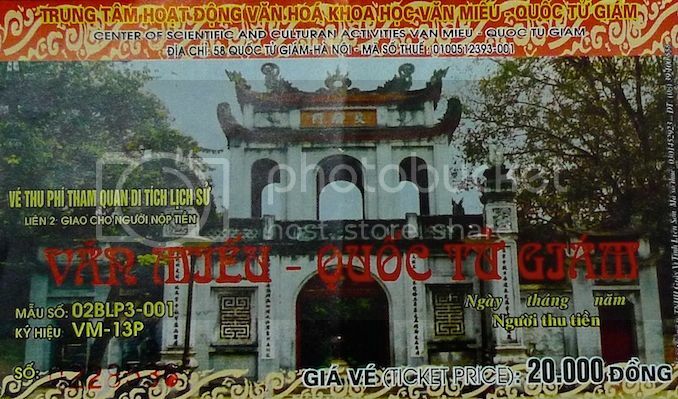 The entrance fee was 20,000 VND (about US$1). 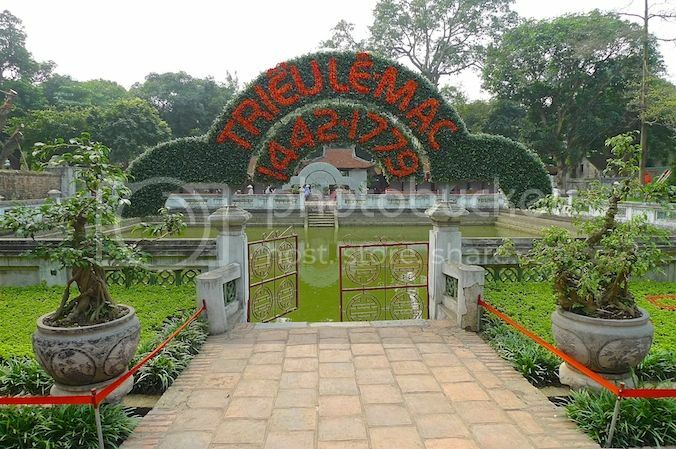 The picture depicted on the ticket is the Main Gate as shown below. 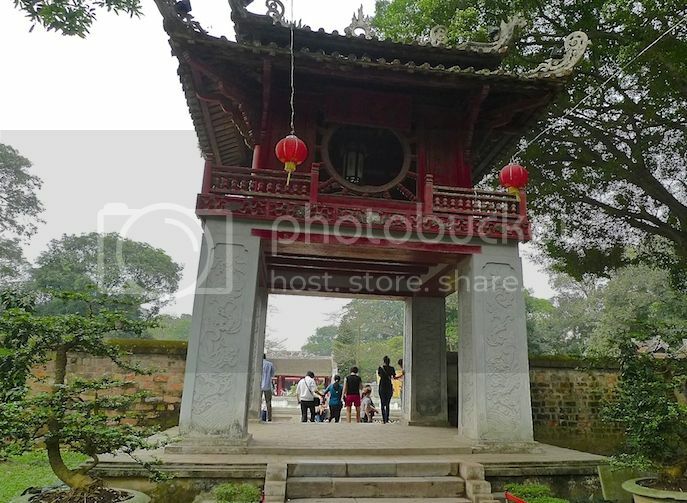 Known as Van Mieu - Quoc Tu Giam in Vietnamese, the Temple Of Literature hosts the Imperial Academy, Vietnam's first national university. This shows how religion and education were linked in the olden days. 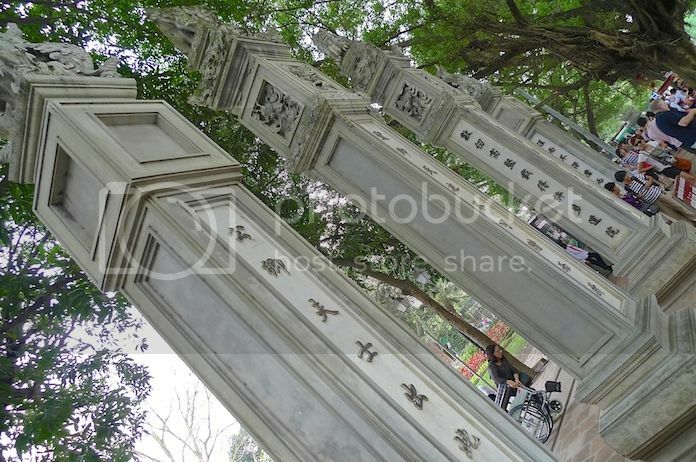 Initially reserved for the rich and the royalties, the university was later opened to outstanding students elsewhere in Hanoi. 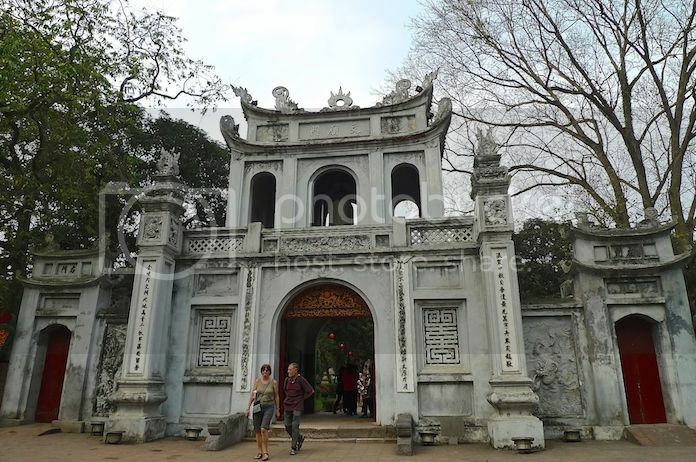 Built by Emperor Ly Thanh Tong in the year 1070, the Temple Of Literature is dedicated to Confucius, whose influence is a huge part of Vietnamese culture. 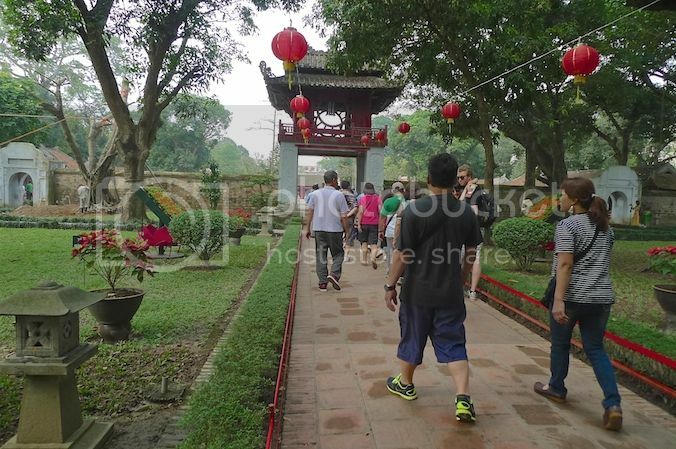 Passing through the Main Gate, a huge courtyard with gardens greeted us. There were three pathways leading to the second gate - one on the far left, one of the far right and one in the middle. I think the path we were walking on is the middle one. 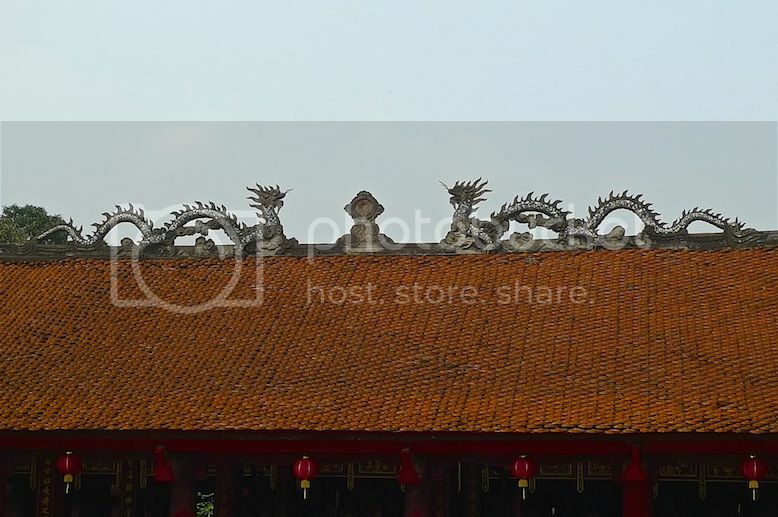 The Temple Of Literature is in fact a large rectangular complex consisting of five courtyards surrounded by a brick wall. 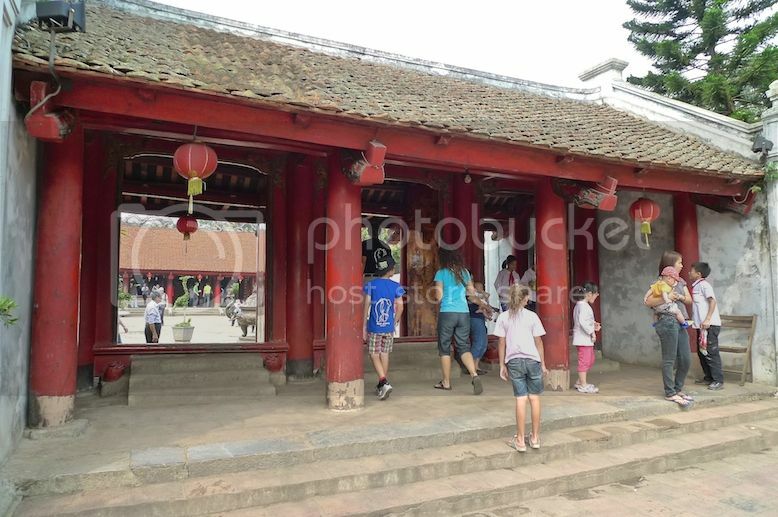 Walking straight ahead, we soon reached the second gate that leads to the second courtyard. At this second gate, there were information about the temple on both sides of the walls. The second courtyard was really a huge lawn filled with ancient trees and trimmed plants. 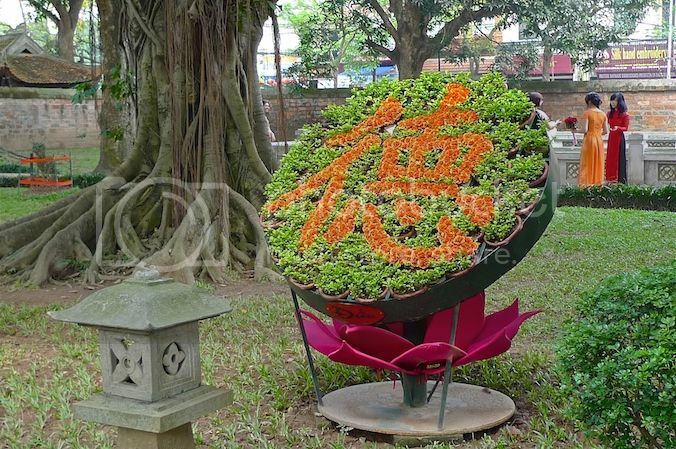 Look how beautiful the plants were trimmed and arranged to form a Chinese character! I could almost imagine scholars relaxing on this beautiful lawn after their studying hours. 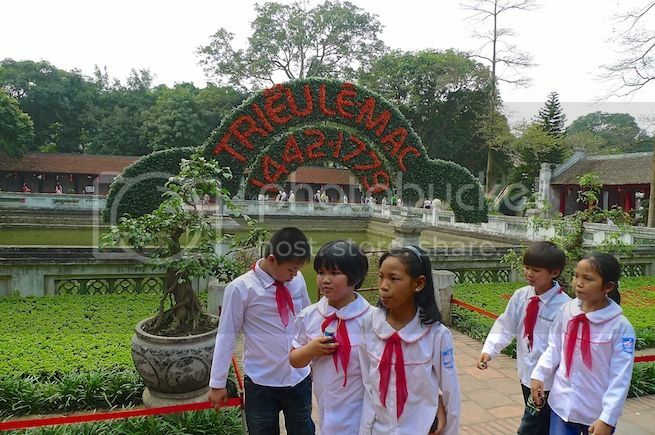 Walking further, we soon reached a unique structure called the Constellation of Literature Pavilion (Khue Van Cac in Vietnamese). 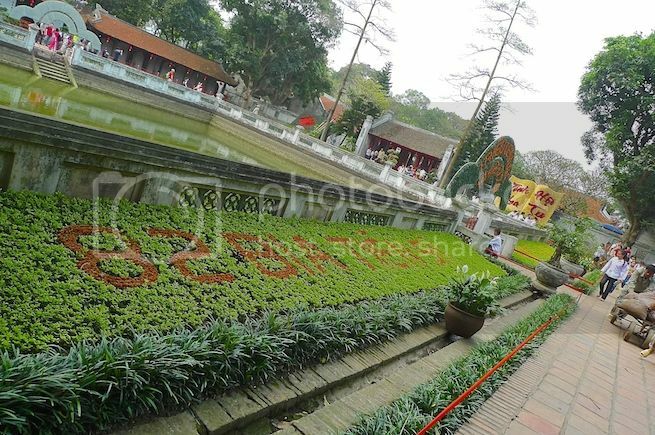 Flanking on both sides of the Pavilion were two smaller gates. Can you see the two small gates in the picture below? 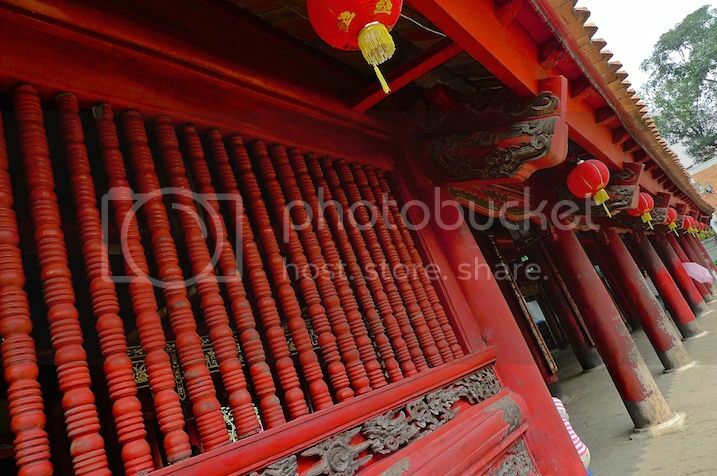 Built on four white-washed stone stilts, the red colored Pavilion has two circular windows on top and an elaborate roof. 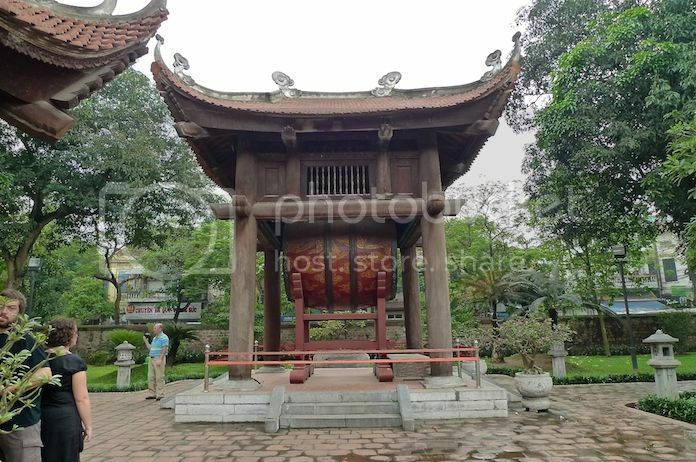 Inside, there is a bronze bell hanging from the ceiling. View of the Pavilion from the other side. Walking past the Constellation of Literature Pavilion, we found ourselves in the third courtyard. 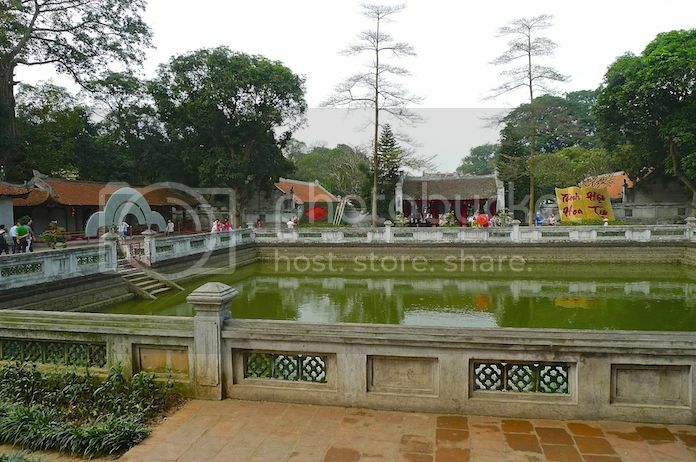 Here, there is a small pond in the middle known as The Well of Heavenly Clarity (Thien Quang Tinh in Vietnamese). On both sides of the Well are two halls which house tortoise-carrying stalae. Out of the original 117 stelae, only 82 remain today. 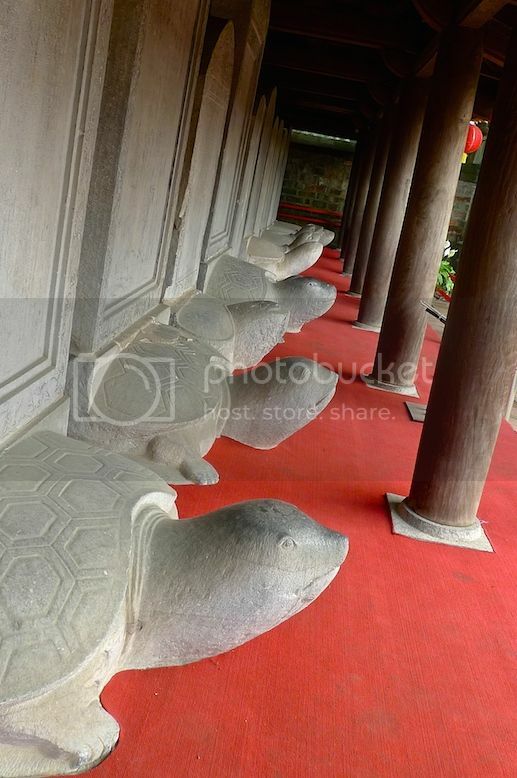 The tortoise-stelae depict the names and birth places of graduate students who accomplished exceptional results in the exams. 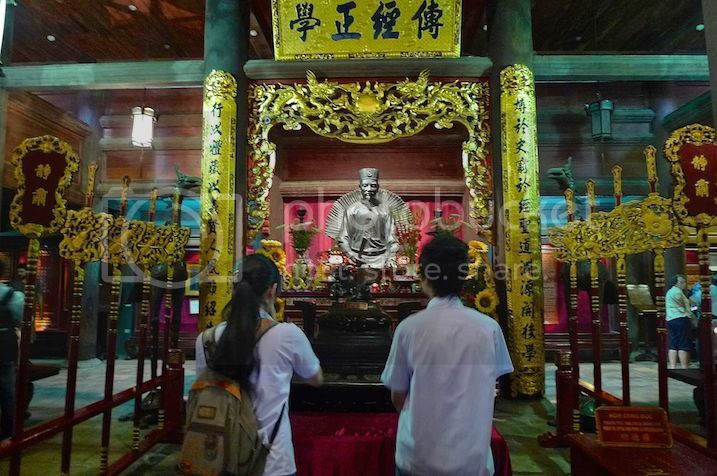 Between 1442 and 1779, 81 exams were held by the Le Dynasty and 1 was held by the Mac Dynasty. Oh, there was a group of school students (I think) blocking the view! So I took the picture again after they left. LOL! I guess touching those stone tortoises or the stalae were prohibited as they had clearly restricted the access to them. Perhaps there were visitors or tourists who vandalised these stone slabs in the past? What does this giant book says? I have no idea. 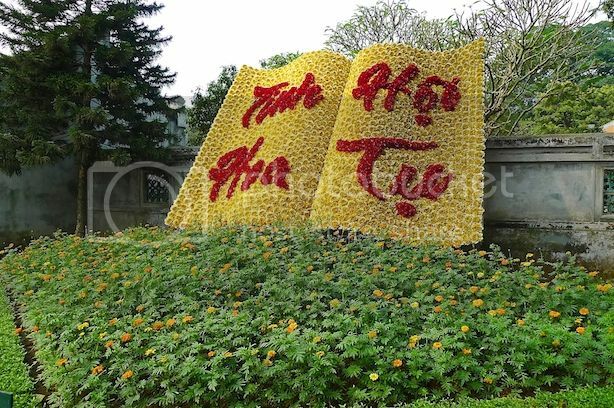 Any Vietnamese reading this knows? 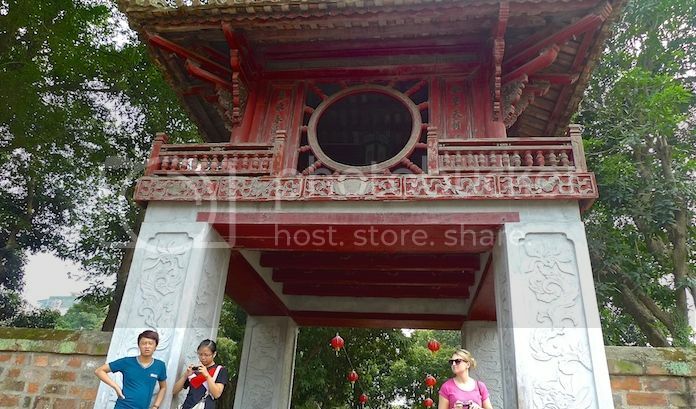 This is the gate leading to the fourth courtyard of the Temple of Literature. 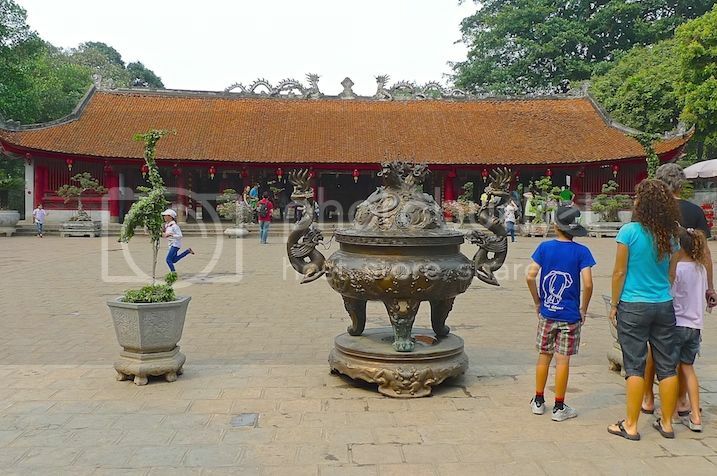 In the centre of the courtyard is a building that housed altars. Somehow, I did not take any pictures inside the building so I could not remember what was inside. 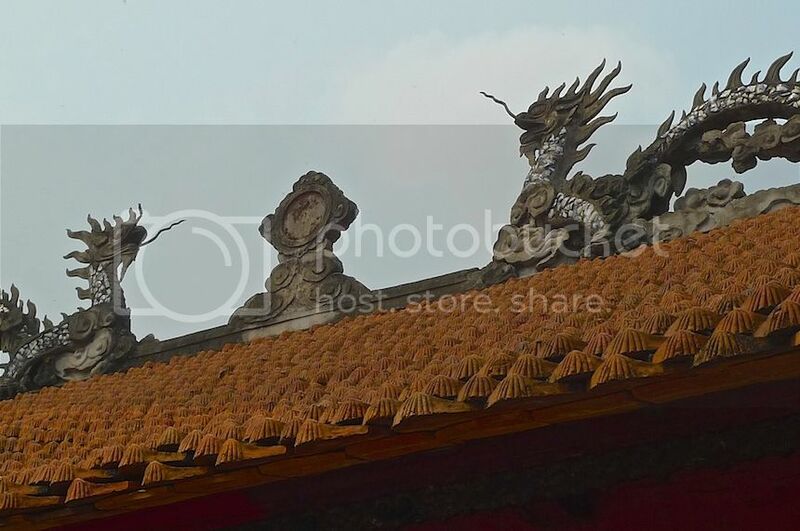 I guess I was more interested in the dragon carvings on the roof top! There was only one picture I took and it's this one - a crane standing on the tortoise. In fact, there were two of them, one on each side of the entrance. 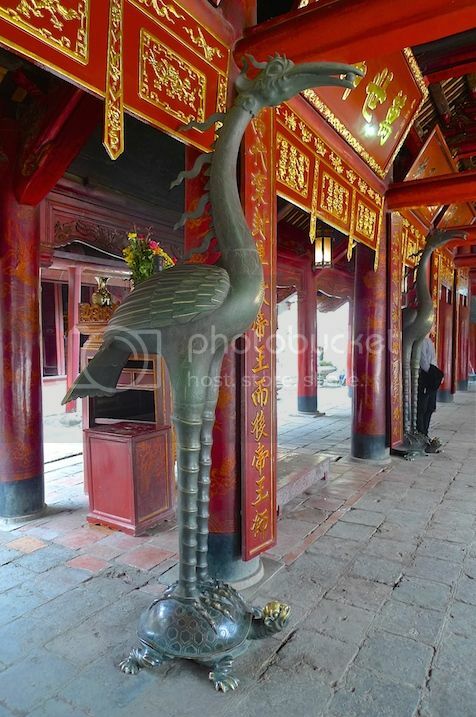 I never failed to see the crane standing on the tortoise in all the temples I visited in Hanoi. 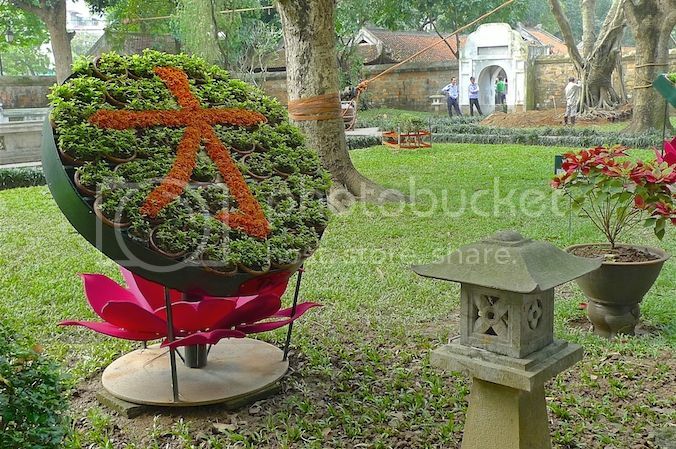 I guess in Vietnamese culture (as well as Chinese culture), the crane and tortoise represent longevity and happiness. 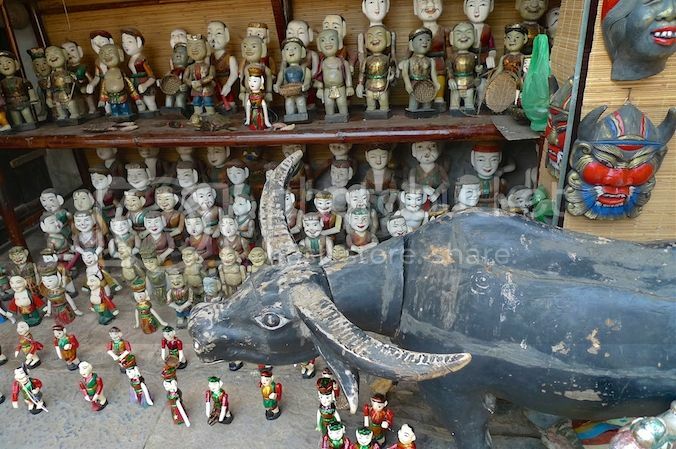 Nearby, there were souvenir shops selling water puppets and some really interesting looking masks. 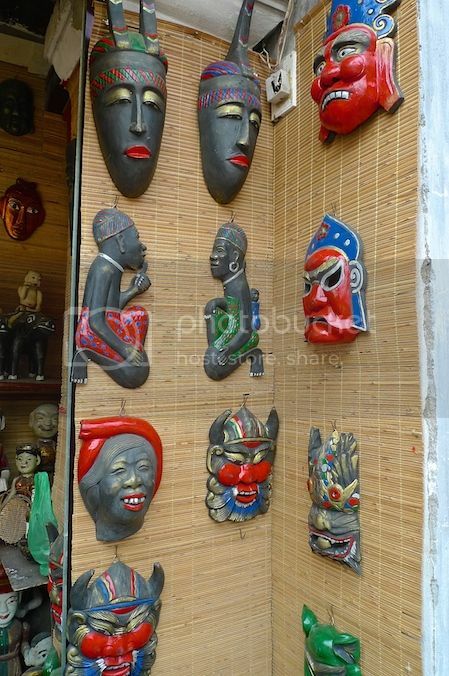 I normally do not like angry and ugly looking masks - I would never hang them in my house anyway - so the thought of buying them had never crossed my mind! 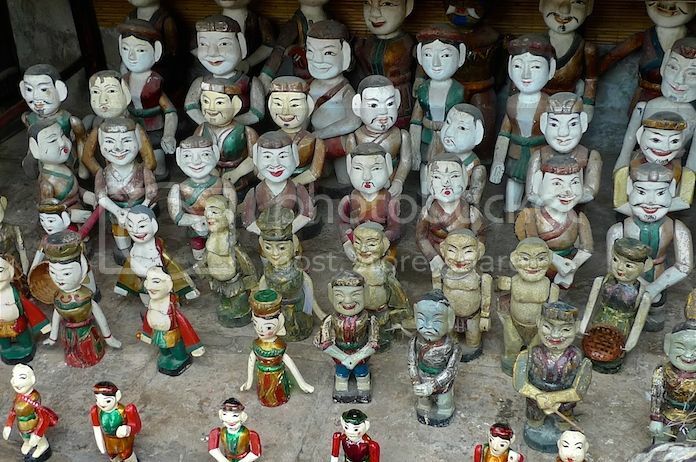 The Water Puppets would make great souvenirs, but I think you would probably get a better price for them elsewhere. 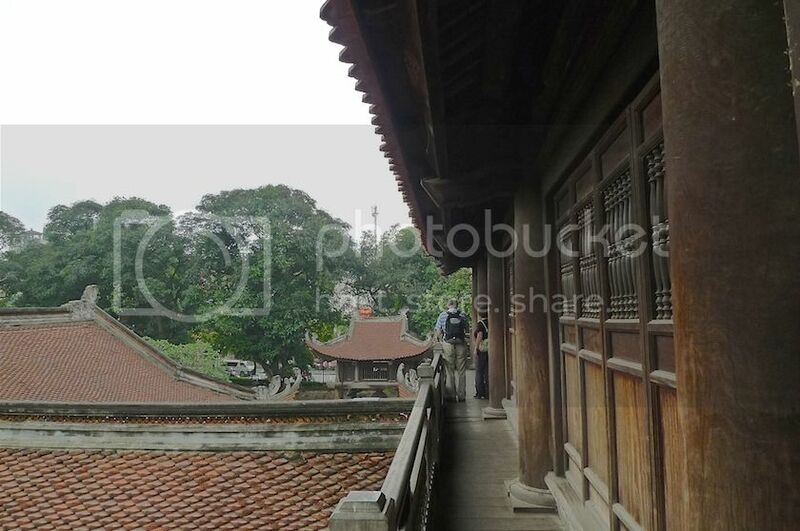 Finally, we came to the fifth and last courtyard of the Temple, which is the grounds of the Imperial Academy. Destroyed by the French in 1946, this courtyard was reconstructed in the year 2000 based on traditional architecture. Nowadays, cultural events were often organised here. 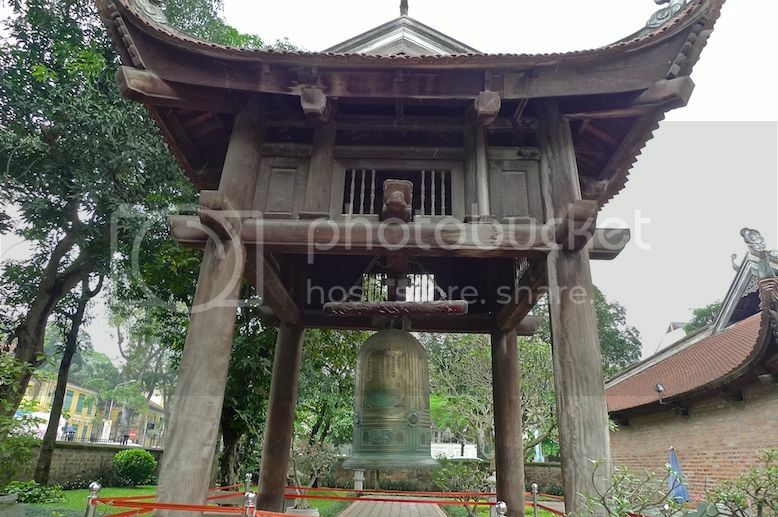 There is a huge wooden structure at one part of the courtyard that houses a giant bronze bell. 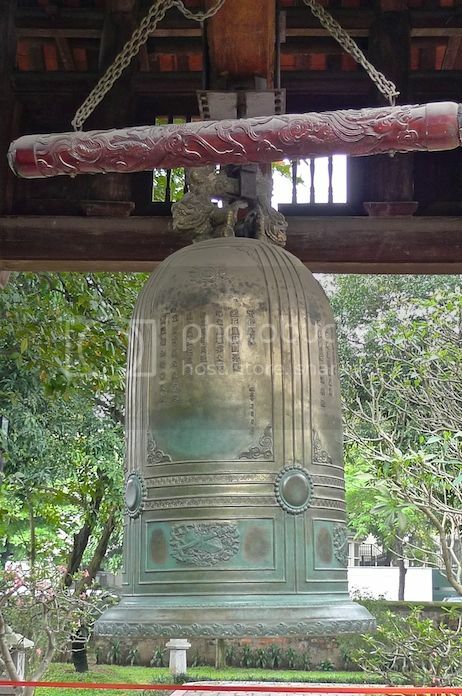 A closer shot of the bronze bell. 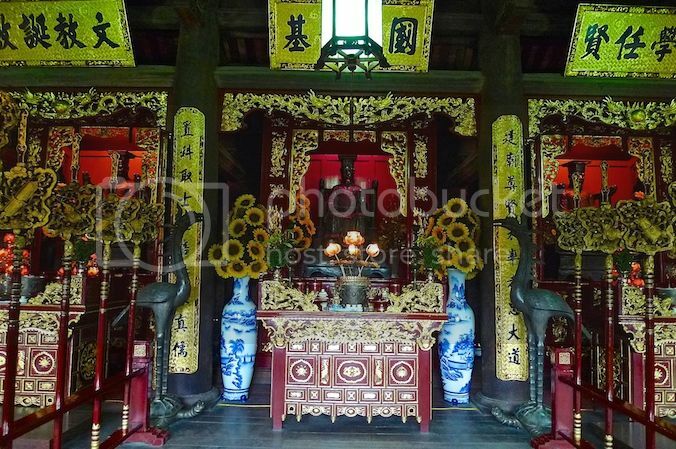 Inside the main building is an altar probably dedicated to Confucius. Look! There's a crane standing on tortoise again! 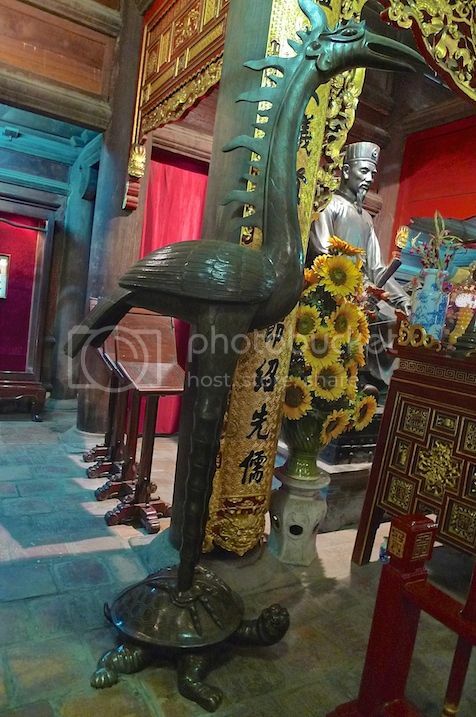 Now, I may be wrong about the Confucius statue. 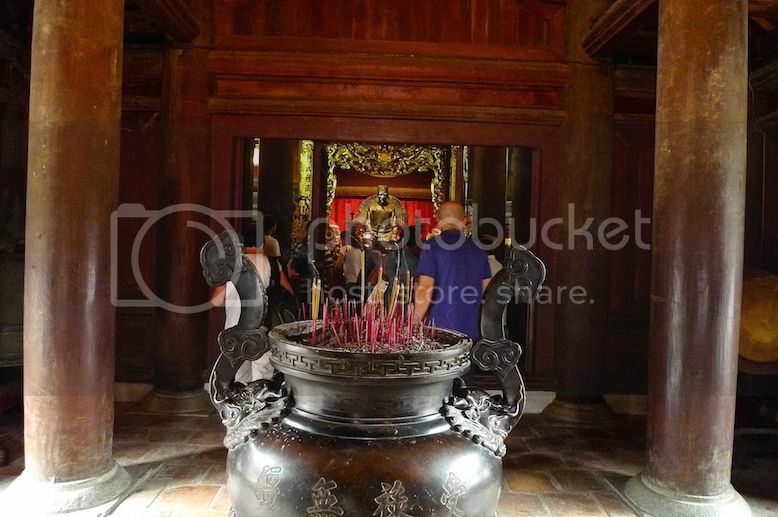 Anyone reading this knows if that is in fact, the altar dedicated to Confucius? You can of course engage a guide at the ticketing counter to explain the history and everything else in detail, and to confirm if the above is indeed a statue of Confucius. But we did not engage any guide that day. On the first floor, there were three different altars. One of the three altars. 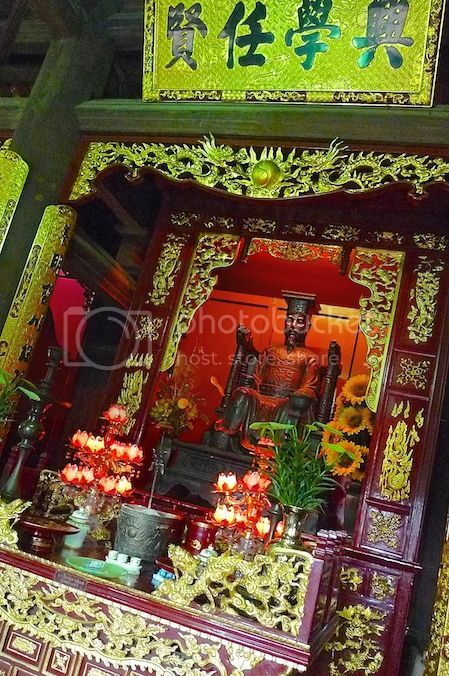 I guess the middle altar is dedicated to Chu Van An, rector of the Imperial Academy. Again, I may be wrong of course. So any reader who knows, please correct me. 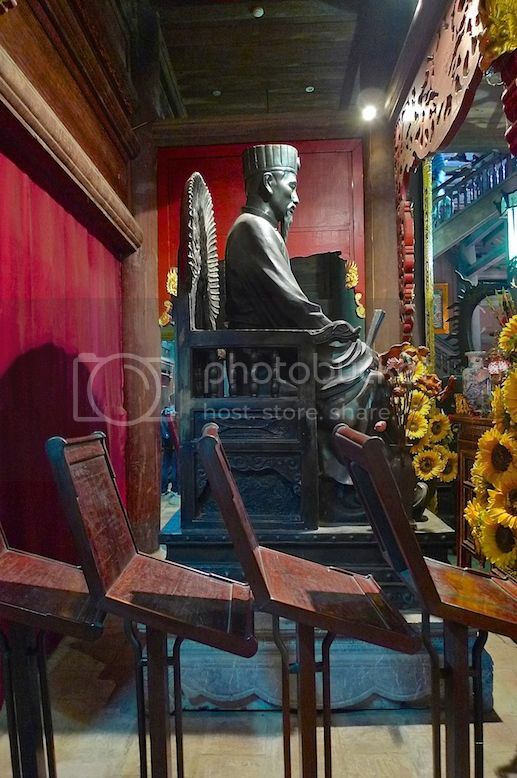 By the way, if you do not know who Chu Van An is - he's considered the greatest scholar in Vietnam's history! 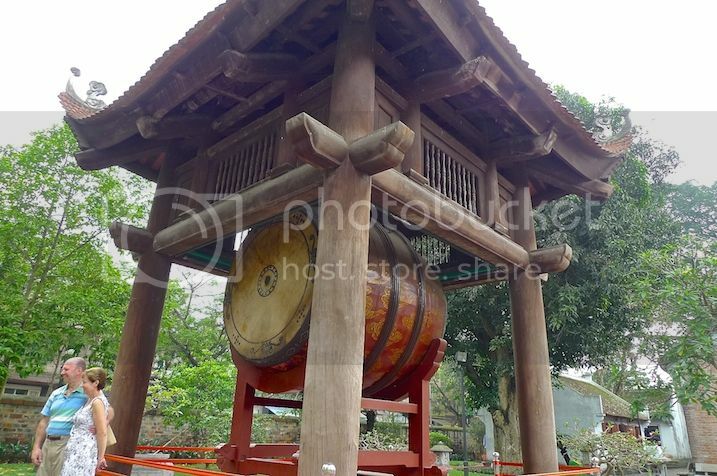 Outside, beside the main building, is another structure that houses a giant drum. Look how huge this drum is! 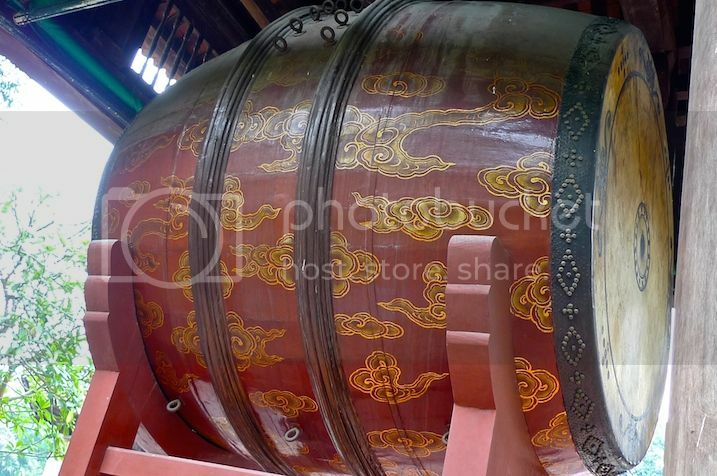 A closer shot of the drum. 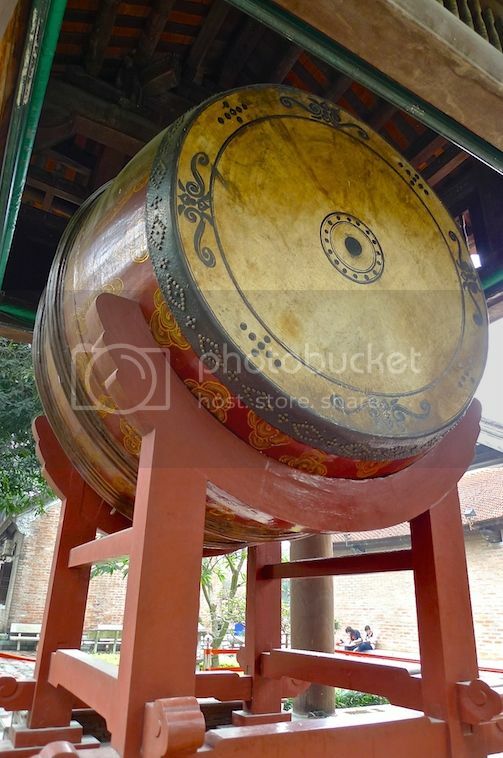 Guess how much does this giant drum weigh? Let me tell you now - it weighs 700 kg! 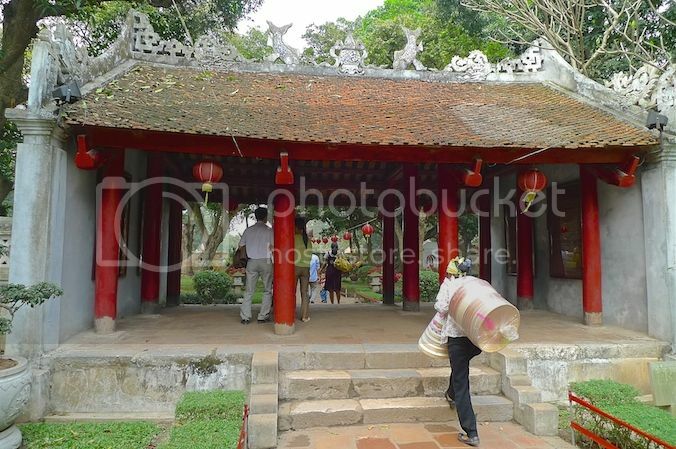 My friend and I had enjoyed visiting this Temple of Literature. 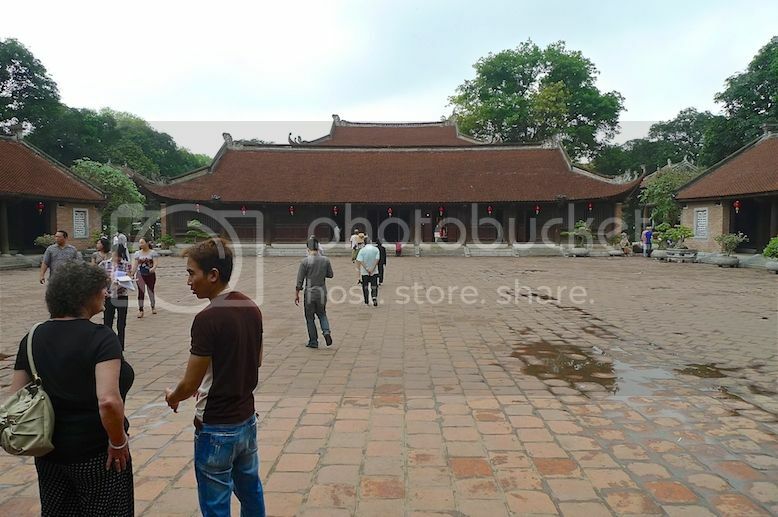 It's definitely one place you must visit if you are a first time visitor to Hanoi. 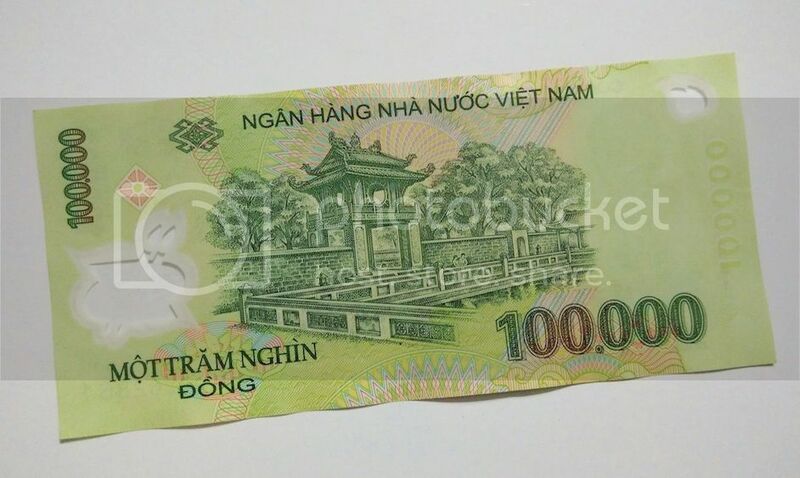 Oh by the way, did you know that the Temple of Literature is so important in Vietnam that it is actually featured on the back of the 100,000 Vietnamese Dong bank note? Yes, that's the Constellation of Literature Pavilion and the Well of Heavenly Clarity!